Over 280 million birds are produced each year in East Texas, generating over 300,000 tons of litter. This litter is also a great resource for our area when properly utilized. Most of the litter is now spread on our pastureland providing good fertility and soil amendments. A potential problem can arise when litter is applied for a long period of time causing a buildup of phosphorus. Our goal is to help the industry find more markets for this resource to provide more off-farm options. Our litter management project has made a lot of progress thanks to our many partners. We have demonstrations with both the Overton and Beaumont Agricultural Experiment Stations. 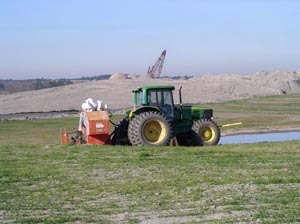 Dr. Gerald Evers at Overton is working with the Sabine Mining Company to demonstrate the benefits of poultry litter for mine reclamation using grass. 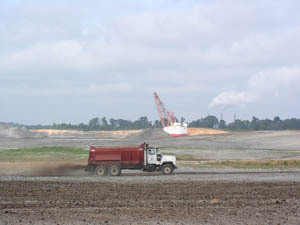 Sabine Mining will also use the litter for the sites planted with trees. Panola Soil and Water Conservation District partnered with TXU Mining to demonstrate the use of litter on their mined land. Dr. Fred Turner with the Rice Experiment Station in Beaumont has demonstrations on both rice and turf grass. Our primary partner is Stephen F. Austin State University and Dr. Leon Young. 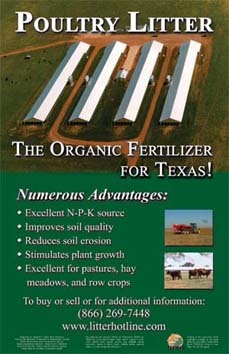 Funding was provided by the Texas Soil And Water Conservation Board and the Environmental Protection Agency. Posters and flyers are available free of charge through the RC&D Office.